As we commemorate the 74th anniversary of the fateful Dieppe Raid of August 19, 1942, we would like to share the story of Jim (James) Tracy, whom we met and interviewed at the Juno Beach Centre on July 8, 2016. With a most unusual and incredible war experience, this veteran returned to Europe for the first time since the war. Accompanied by his family, he was on a quest to retrace his own past and deepen his understanding of events. Interview by Matthieu Reekie, Juno Beach Centre guide. Jim Tracy and his family at the Juno Beach Centre Juno Beach on July 8, 2016. Jim Tracy was born on November 18th 1920 in Edinburgh, Scotland. After becoming an American citizen, he lived in Indianapolis, Indiana, USA. In the summer of 1939, he was attending the World Scout movement in Scotland when war broke out on September 3rd between Germany, and France and the United Kingdom. As the war required the mobilization of resources, his scheduled crossing back to America was cancelled, and he ended up spending another month or so in the UK. Upon his return to the United States, despite his country’s lack of engagement so far in the war, he felt compelled by duty to do his part in the war, and made up his mind to join the Canadian forces. Initially drawn to the Royal Canadian Air Force, he was turned away. In spite of having the fourth largest air force in the world by the end of the war, in 1939 the RCAF was a shadow of its future self, and could not accommodate many new recruits early in the war. “I was undeterred, and convinced that the war would be over in six months, so I joined the army instead”. Turned away in Windsor, Ontario, he was directed to London, Ontario, where he joined the Royal Canadian Regiment, the first battalion in the First Canadian Division. The regiment was soon sent to the UK, and he arrived in Glasgow, Scotland, on December 27th 1939. Jim spent the next couple of years in the south of England, preparing what was at the time often called “the invasion”. “I recall riding around the English countryside on a motorcycle in a uniform stripped of all markings and designations, in order to create the illusion of a larger defense force than there actually was”. When the United States entered the war in 1941, there were many Americans fighting with the Canadians and British who were allowed to transfer into the American forces. However, this wasn’t the case for Jim Tracy, whose commanding officer told him they had “spent too much money on him” and that they wouldn’t allow him to be transferred. In 1942, young soldiers were recruited for Operation Jubilee. Attached to Lord Lovat’s famous No. 4 Commando, Jim took part in that unit’s operations during the Dieppe raid. On August 19th, 1942, came the crossing of the Channel, the barges which open at dawn, the soldiers running over the pebbles. Near the cliffs of the little beach of Vasterival, Jim accompanied the British commandos on their mission to disable a German battery capable of shelling the main landings, and to destroy their means of communications. This was a baptism of fire for Jim who covered those responsible for the mission. “We came from various units and we had never trained together”. He remembers all at once the barbed wire being cut, the thunderous noise of fire, the final explosion and the withdrawal. All this was experienced in a state of intense and unreal concentration, and mobilization of all his senses. Rejoining his battalion upon his return, he then headed out with the rest of the 1st Canadian Infantry Division towards the Mediterranean to participate in the invasion of Sicily in 1943. However, his transport ship was torpedoed along with two others. He recalls the utter chaos as the Canadian troops on board tried to cooperate with the sailors of the ships, mostly Indians who spoke little, if any English. He remembers the sailors struggling to launch the landing craft from the heavily listing ship. His lifeboat was the only one to stay afloat. After this disaster at sea, he was sent to North Africa. Due to his knowledge of the invasion, (having been briefed on it before his boat sank), he was isolated in a camp, before being sent to join his unit in Sicily. On his way across the Mediterranean, however, his LCI ran into some mechanical trouble, and he was forced once again to go back to North Africa. He finally joined his unit about 10 days after the initial landing in Sicily. He stayed with his unit all throughout their time in Italy, landing on the Italian mainland at Reggio Calabria. Tracy himself was wounded in southern Italy and spent some time recovering in hospitals in Naples and Sicily, before once again rejoining his unit. “To this day, splinters of shrapnel will surface from my neck, quite normal!”. The 1st Canadian Infantry Division participated in some hard fighting in Italy, passing near Naples and liberating Ortona and the Po valley. He recalls being at the gates of Rome when the order arrived to halt to allow the Americans to liberate the city. “It was explained to us that the heavy Italian immigration to the United States had created a close relationship between the two countries, but we didn’t appreciate having to wait around for 3 days for the Americans to finally enter the city”. In fact, Jim didn’t wait around: he “acquired” a motorcycle, and went for a joyride around Rome, seeing some of its greatest landmarks such as the coliseum and the Vatican. At this point, he felt quite bitter towards the Italians, having lost several of his comrades, including his friend Roger, who was killed in Sicily. These feelings of bitterness and anger washed over him as he arrived at the Vatican, but upon entering, he suddenly felt calm and at peace. He attributes this to the lovely art and architecture he found there, as well as the feeling of eyes being on him, despite the Vatican being deserted at the time. During his time in Italy, he recalls one of the most difficult types of operation was the crossing of rivers. Rivers act as natural barriers and the Germans would take full advantage of this, drawing their defensive lines along river fronts and other natural obstacles. Despite Italy also being one of the founding members of the Axis, he also remembers the liberators’ welcome he received in many towns and villages. “It seemed that the Italians had had enough of the Germans, Fascism, and Mussolini, and welcomed the allies with open arms”. The division fought on into northern Italy, but was then sent by ship to southern France, and by Rail to Belgium, where it formed the 1st Canadian Army with the other Canadian divisions and divisions of other nationalities. The 1st Canadian Army fought on through Belgium, the Netherlands before finally entering Germany. Tracy, however, never got to see the latter, as shortly before the crossing of the Rhine, he was sent home for what would turn out to be his last leave home of the entire war. 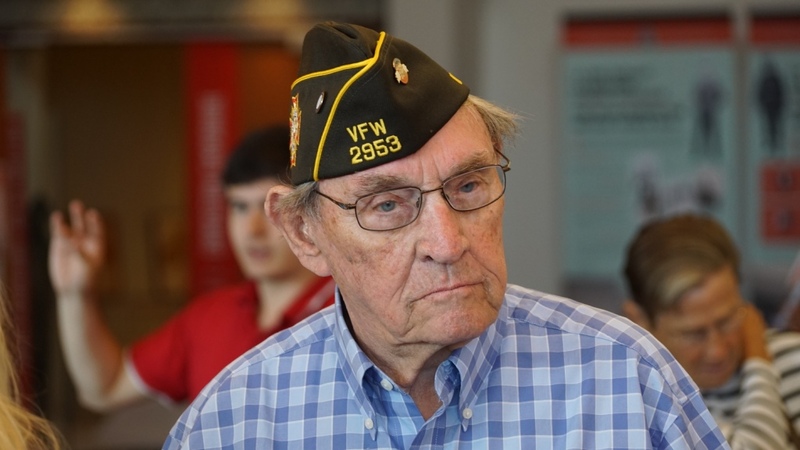 During his time back in the U.S.A., Germany surrendered, and he was given two choices: either stay in the army, and participate in the occupation of Europe or possibly fight in the Far East, or else be released from his service and return to civilian life. Originally believing that the war would be over in a matter of six months, he never expected his time in the Army to last five and a half years. He saw his chance to get out and he took it. After the war, Tracy worked briefly for a car company in Detroit before working for AT&T. Tracy returned to Europe for the first time in July 2016, accompanied by his 3 children, Steve, Christina, and Laura, his daughter-in-law Sheri, son-in-law Jim, his two grand-daughters Megan and Claira, and family friends, Sue and Dennis. In Normandy, he was welcomed at the Juno Beach Centre where the staff was honoured to meet with him and to collect his testimony. He was also welcomed with due honours at the Dieppe Memorial by Association Jubilee, 74 years after his first taste of battle at the Dieppe raid. During his visit, he was able to pay his respects to his brothers in arms who fought alongside him in Normandy so many years ago, many of whom never made it back. Jim Tracy and his daughter with the director of the Juno Beach Centre (right). Jim Tracy and his family follow Matthieu for a guided tour of Juno Park. Jim Tracy at the Dieppe Memorial with one of his grand-daughters and Martine Pietrois, president of the Association Jubilee. Jim Tracy and Martine Pietrois.